The New South Wales government has revealed plans to digitise public records and make it easier for agencies to share data. Announcing the government’s ICT strategy update for 2014-15, NSW Minister for Finance and Services, Dominic Perrottet, also unveiled a new mobile app that he said would forward the government’s goal of using technology to enhance customer service. Perrottet announced a strategic review that will examine alternative approaches to collecting and storing records generated by public sector agencies. The minister said state government agencies generate terabytes of data each day and it’s only expected to increase over time. “I believe that we now need to transition from paper to petabytes,” Perrottet said at an AIIA lunch today in Sydney. “The records of the future are digital, and the repositories of the future are data centres. Perrottet said he has also asked his department to explore ways to improve data sharing among government agencies, following a recommendation from the ICT Board. Perrottet also spoke about the importance of open data last week at the Open Data Summit, where he announced a $45,000 contest for innovative app ideas. 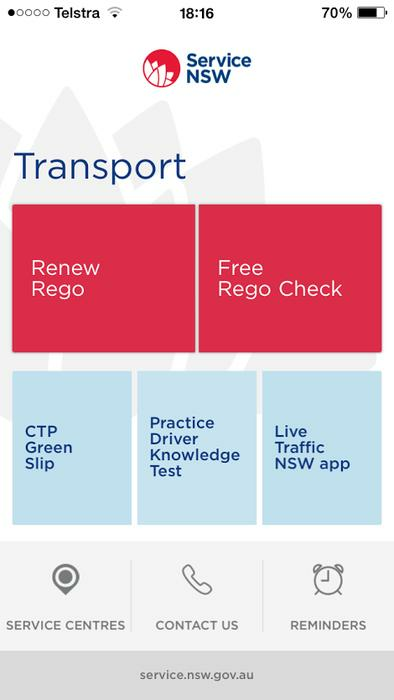 To enhance government service delivery, the NSW Rego iPhone app will be rebranded under the Service NSW banner and expanded to offer more government services, Perrottet announced today. A look at the Service NSW iPhone app, coming in November. The app, to be released first for iPhone in November and followed by Android later this year, will allow customers to renew vehicle registration, check registration status, set reminders and locate government facilities. The NSW government plans to add more services in the future. Perrottet said it is critical for the government to have a customer focus. “Ultimately, government is the servant of the people and our processes and our technology should reflect that,” he said. He said digital is less about government and technology than it is about enhancing customer experience. Perrottet praised Service NSW, which he said now has a satisfaction rate of 98 per cent positive. The entity has served more than 6 million customers across online, telephone and physical service centres, he said. Perrottet also announced today that Amazon Web Services will join the ICT Services Scheme. The Scheme offers a panel of prequalified suppliers providing ICT services to NSW government agencies. In 2013-14, the NSW government acted on more than 40 actions of its ICT strategy, and the government said it expects to act on another 45 actions in 2014-15. The NSW ICT strategy had an initial set of 85 actions when it was launched in May 2012, noted John Hubby, acting chief executive of the Office of Finance and Services. “A very senior colleague of mine at the time said it’s the longest public-service suicide note in history,” he said. Who is entitled to be called ‘head of digital’?